Recover Lost Revenue! Maximize efficiency by automating your identification, invoicing, receivables and delinquency processes. Use of extensive automated cross referencing combined with the software’s ability to leverage staff resources will enable the City to recover unreported or misallocated revenue that previously was inaccessible. 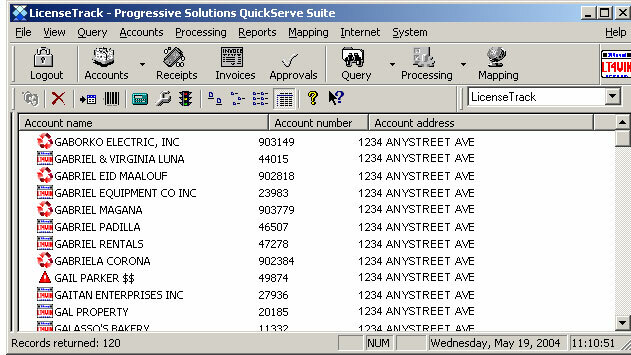 Tight integration with PSI’s LicenseTrack™ Business Licensing Software. All follow-up correspondence is automated and tracked. Invoices may be entered once into the business licensing system. Invoices may be efficiently tracked. Use of the internet for identification, audit and payment efficiencies. PSI’s fee for RevenueTrack™ Services is 12.5% of newly identified realized benefits; compared with the fee of 20% to 25% charged by traditional audit firms. Proactively managing sales and use tax revenue streams will help prevent “audit discoveries” from other jurisdictions. By using available data such as SB1146 (formerly AB63) and AB990 data and performing cross checks, business activity becomes transparent and auditable by the city. Working with targeted city-based businesses on a technical basis can increase the situs allocation of both sales and use tax. For example: an auto auction house may yield minimal, if any, revenue to the city. A special program can be implemented that will capture significant revenue from this activity. It could yield $40,000 to the city in sales and use tax compared to $1,000 in business license tax. Future special events can be setup in a proactive manner. Another important focus will be the self-accrual of use tax by businesses. Working with other government agencies, other cities, counties and transit districts can result in increased situs allocations. Frequently “non-cooperative” taxpayers are located or do business in multiple locations. Forming a coalition of impacted jurisdictions can be an effective way of working with such taxpayers. Increase revenue and reduce costs. Measure and manage audit activities. Proactively identify opportunities to maximize general revenue through city audit activities. Utilize SB1146 (formerly AB63), AB990 and other data to identify and flag non-compliant businesses. Proactively identify and implement opportunities to ensure that businesses maximize allocation of sales and use tax to the city. Provide State Board of Equalization with misallocation corrections and follow-through to ensure the corrections are made. Institute processes and procedures to measure the effectiveness of the SBE, the taxpayers, and audit firms. Provide educational assistance as needed to help the city maximize its sales and use tax revenues. Provide the means to invoice non-compliant business within the business licensing software. Provide reporting that creates snap-shots of non-compliant businesses discovery and payments.